Discussion in 'Announcements' started by Palindrome, Jan 11, 2017. This was a much requested feature from the DLP Uservoice, so thanks to all who suggested it. You now have an option to hide offending threads, rendering them invisible as you browse. You'll still get notifications if you're quoted or mentioned within the thread, but it'll never again turn up to plague you in thread displays. 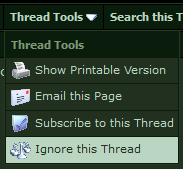 To ignore a thread, click the dropdown box called Thread Tools (found at the top of any thread), and click 'Ignore this Thread'. 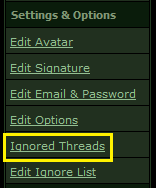 If you want to remove a thread from your ignore list, or would like to simply marvel at how many theads you're ignoring, head on over to your User CP and you'll find the options for Ignored Threads under Settings & Options. Click 'Stop Ignoring This Thread' to see it again. Oh man, that is amazing. I'm gonna go test this now, so I guess no need to answer, but I'm hoping that this also works for those who browse using the "New Posts" function. Thank for continuing to improve the forum. Here I thought we'd already hit the top. Naruto, prepare to be purged from my universe. I'm hoping that this also works for those who browse using the "New Posts" function. Is it possible to ignore entire subforums, though? I'd love to ignore little Italy and the Naruto subforum if possible. DLP forum is best forum on Interwebz. This is a hard fact. No, but you've given me a better idea: the ability to customise what turns up for you in 'New Posts'. I'll have a think about that one. I think Reddit does a pretty good job of that with it's filtering system. Perhaps an idea can be taken from that. Bring back the introductions subforum? Jokes aside, I'd like a theme that plays well on mobile. If you want to suggest stuff and not have it be lost to the gormless void, stick it in the DLP Uservoice. You'll find a link to said uservoice at the bottom of every page under Idea? Feedback? Perhaps I missed it, but any chance to simply ignore an entire forum section, or subforum(as per your quote showing Little Italy earlier in this thread)? Drome simply had a thread ignored, and if it's the most recent updated it shows that message. If you browse by new post, you can at least ignore the current game/sign-up thread in Little Italy to cut back on the flooding. It's good to know I won't be the only person using this feature expressly for that purposed. Bump. Is this still an option with the new forum? Or, at least, an ability to remove threads/forums from 'What's New'? I'm pretty sure I have Little Italy ignored, but I can't figure out how to do that for another thread.